Respected. Renown. Talented. 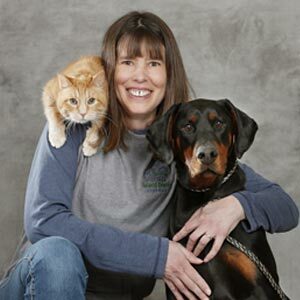 The team at Billings Animal Family Hospital is truly a cut above, united in a singular focus: providing your pet with the absolute best medical care possible. Dr. Edie Best received a Bachelor of Science degree in Biology from Montana State University in 1990. In 1995 she graduated with honors from Colorado State University with a Doctorate in Veterinary Medicine. She then became a board certified Diplomate in the American Board of Veterinary Practitioners (ABVP) in 2003 and re-certified in 2013. She is certified in Canine and Feline Practice. The ABVP represents a group of veterinarians who have demonstrated exceptional knowledge, skill and competency in the care of the “total patient”. The rigorous certification process must be repeated every 10 years to maintain these high standards. In 2017 Dr. Best also became certified in Veterinary Medical Acupuncture. She uses acupuncture treatment in her practice for a variety of musculoskeletal and neurologic issues and pain management. Her practice interests include canine reproduction, internal medicine, cancer diagnosis and treatment. Dr. Best purchased Billings Animal Family Hospital in 2008. She and her husband live in the Huntley area and have 2 dogs, 5 cats, 2 horses and a donkey named DumDum. Outside of work she enjoys boating, hiking with the dogs, “glamping” and spending quality time with friends and family. She “jogged” her first half marathon in 2012 and continues to stay active when the Montana weather cooperates! 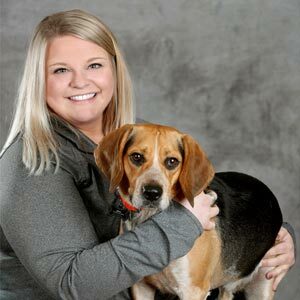 Dr. Sarah joined the BAFH staff as a veterinarian in 2014 but she has worked here off and on through her college career since 2001 where she started as a receptionist. After she finished school, she left for Missoula to get her Bachelor Degree in Zoology. After she finished her BA, she left for Dublin Ireland to join their AVMA accredited Veterinary Program. 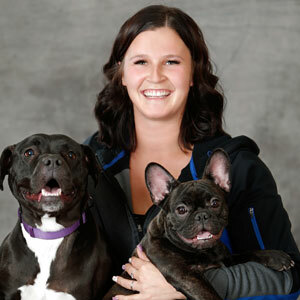 She graduated in 2011 with her MVB in Veterinary Sciences and then returned home to Montana. Dr. Sarah enjoys small animal internal medicine/surgery but also loves to work with the more exotic type pets and wildlife. During veterinary school she spent time externing in Santa Barbara Zoo Veterinary department and working as a seasonal animal keeper at our own ZooMontana to further this passion. Her family includes 4 cats: Nadia, Poppet,Widget, and Thor; plus 2 dogs: Maximus and Bandit. On her free time she enjoys reading, baking and spending time doing outdoor activities with her animal friends. Dr. Jonnae Slade had been with us since the start of 2018. Her roots are in Loring, MT where her family still farms and ranches. She received a bachelor’s degree in biological sciences at Montana Tech in Butte in 2007. From there, she went on to get her veterinary degree from Colorado State University in 2012. 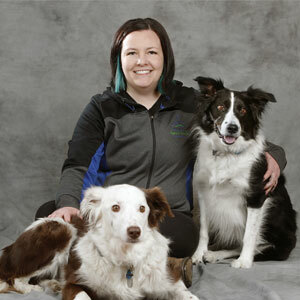 She also completed certification in veterinary medical acupuncture while in Colorado in 2012. Since then, she has developed a special interest in rehabilitation and pain management. In 2009, she married Jim Slade and they have a son, Kellen (2016); and a daughter, Kenna (2019). Baxter is the gray and white kitty, who has been with her since Butte. He is getting older, but still doing very well. Sally joined the family in 2018. She is a little red mixed breed dog introduced to her by Rimrock Humane Society. When not here at the clinic, she enjoys spending time with family and friends, helping out with kids ministry at Harvest Church, time in the outdoors, crafts and music. 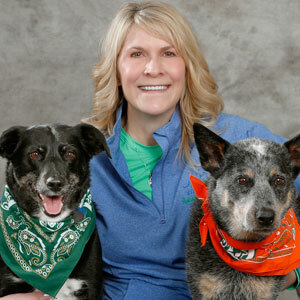 Cynthia joined the Billings Animal Family Hospital team in July of 2000. She has a B.S. 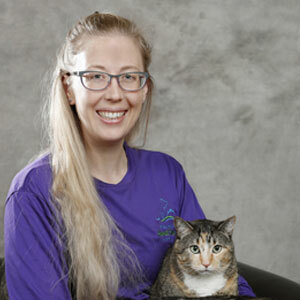 in Biology and Chemistry Education and while working here became a Certified Veterinary Technician in 2006. Although presently there are no pets in her household, she has taken in many in the past and given them loving homes. When she isn’t caring for the animals here, you can find her and her husband enjoying the outdoors, hunting, fishing, and exploring the mountains. Chanda started working in the veterinary field as an assistant after school in high school. 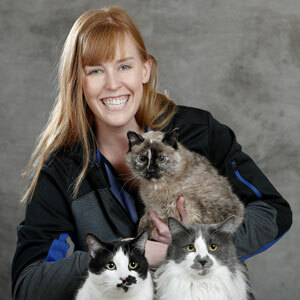 After graduating from West High, she moved to Minnesota to pursue her veterinary education. 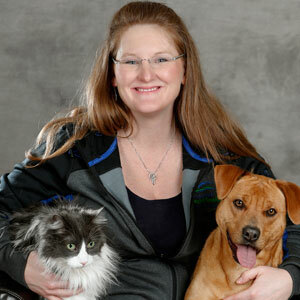 She received an Associate Degree in veterinary technology and took the national exam in 2008 to become certified. She moved back to Montana to work and has been in Billings since. She has special interest in parasites and exotic animals. She worked at the zoo for a year and got to work on many species. She is married and has a son, Hank. She has two rescued Border collie named Major and Tegan. In her free time she likes to volunteer at low cost spay/neuter clinics, watch reality TV and hang with her family. Autumn joined the team at BAFH in April of 2016. She earned her B.S in Health and Human Performance at the University of Montana. She grew up on a small family farm outside of Billings, where she developed an appreciation and love for animals and nature. Her furry family includes: three crazy cats; Cleo, Alvin, and Theodore as well as her family’s dog, Sophie. Presently, Autumn is working towards a graduate degree at MSUB, thanks to the support of the team. When not working or studying, Autumn can be found assisting her dad on their family farm and enjoying the great outdoors. Her other hobbies include: reading, traveling, paper crafts, watching movies and spending time with friends. 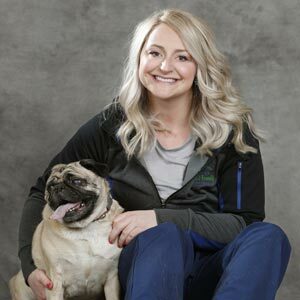 Justine joined the team at Billings Animal Family Hospital in November of 2011, as a kennel attendant and worked her way up to the front desk as a receptionist and food manager. She took on and completed her online course through Penn Foster to become certified as a Veterinary Technician Assistant. 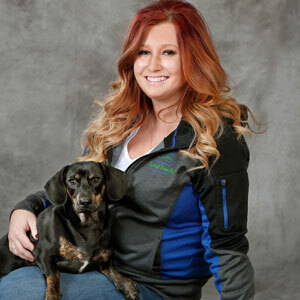 Justine enjoys meeting and helping the clients with their four-legged animals. She also enjoys working and laughing with her BAFH family while she‘s there. 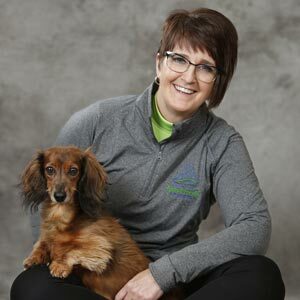 Justine has a wiener dog, Cotter Jo, which she rescued through Rimrock Humane Society as an abandoned puppy found in a field. Justine also works part-time serving at Bull Mountain Grille, which she also enjoys very much. If she’s not working, she is attending to Cotter Jo, hiking, riding, and enjoying time with her nieces, Braelyn& Harper, family, and friends. Katlyn joined BAFH in September of 2018. 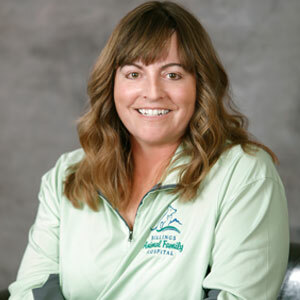 She has been working on her two degrees while balancing college softball and another job the past few years, but now that she is retired she wanted nothing more than to join our BAFH family part-time! Kate currently has no animals of her own, although someday she will have a HUGE farm of her own, with all the animals possible! But for now until she has a backyard, she will just be the Auntie to all of them! When she isn’t working or sitting in class she is spending time with friends, in the mountains fishing, hiking, and exploring new places or she is at the gym working out for hours. Karen grew up in small town in Ohio. In 2015 she moved to Idaho and attended Brigham Young University-Idaho. 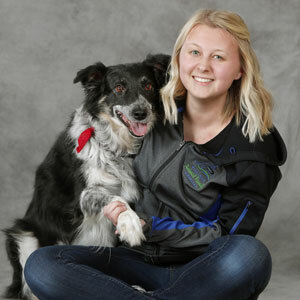 In 2018 she graduated with a Bachelor of Science with a major in Animal Science. After graduating that year she moved to Billings, and became a member of the Billings Animal Family Hospital team. Cameron, a handsome Lab cross, is her pride and joy. Capri started working here in 1996 as a kennel attendant while we were still Heath Veterinary Hospital. You continued to work here as a technician assistant/receptionist up until starting her family in 2011. When her daughter Carla started attending school in 2018, Capri reunited with our BAFH team. She and her husband Walt are owners of 4 cats, Tucker, Spookers, Peanut, and Doctor; 1 mighty Doberman, Diego; lots of chickens, ducks and turkeys, and has a Golden Retriever, Blue, on its way soon to join her crew. When Capri finds time away from her crazy household, she enjoys riding horses, gardening, working, and spending time with family and friends. Also known as Shelly began working here in October of 2000, as a part time employee. Michelle has a degree in Medical Administration with minor in accounting, which she put into great use when she became Office Manager. Michelle enjoys getting to know the clients and their furry friends. She has one dachshund, Trucker, and two so-called barn cats, Munch and Minnie, along with 2 horses and 1 pony, that complete her four legged friend collection. Michelle and her husband John own JM Livestock and Trucking LLC, which keeps her busy in her off days. When she isn’t doing paperwork, she enjoys photography and spending time with her family and beautiful granddaughters, Braelyn Michelle and Harper Joy. Brooklyn joined the BAFH team back in 2012 while in high school as a kennel assistant, and has helped us cover shifts ever since. Now she has returned to us as a part time team member as a Receptionist and Technician Assistant. She has 2 furry family members, 1 Pit Bull, Vegas and 1 French Bulldog, Gretta, who keeps her daughters Braelyn and Harper entertained. When Brooklyn isn’t helping at BAFH you can find her spending time with her family or selling her THIRTY-ONE BAGS. Brittany made her way out west to the Big Sky state in December of 2017, with her cute but spoiled beagle Beau. She picked up roots from a small town in Ohio and planted them in Billings. 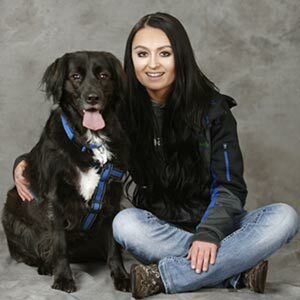 Shortly after her cross country adventure, she came upon Billings Animal Family Hospital and fell in love with working with animals and their people. Brittany is currently a receptionist but plans to continue her education with BAFH through animal nutrition and learning to be a technician assistant. Traveling to far off and beautiful places is one of her favorite things to do along with singing to whatever song is on the radio. Brittany loves the simple things in life and enjoys spending time with her family, friends and of course, Beau. Heather joined the team of Billings Animal Family Hospital in July of 2018 as a front desk receptionist. 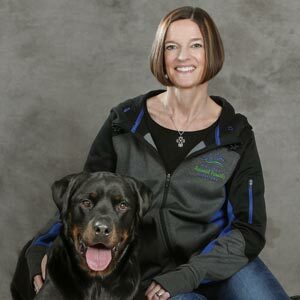 Heather enjoys meeting and helping the clients with their four legged friends. She is originally from Missoula, MT and has lived in a few other states over the years, but call Billings her home. Heather is married to Pete and they have a crazy hyper Rottweiler, Xena and then a Springer Spaniel, Bandit, which are their children, plus 3 outside cats. When she is not working at the clinic she enjoys shopping, reading, boating at Fort Peck, and spending time with family and friends.